Cooper thought living at a campground would be cool. But ever since his parents bought the lakeside campground, he’s had more chores and less time to explore. And as if babysitting his little sister and cleaning the bathrooms weren’t bad enough, his ex-friend Roy has chosen him as this summer’s bullying target. Cooper’s only bright spot this summer is his new friend, Packrat, a guy who carries the world in his coat pockets and leaves his troubles behind. But trouble has come to the Wilder Family Campground and Pine Lake, where a family of loons is building a nest. First, someone dams up the lake and floods the nest. Then, when Cooper and Packrat build a raft where the loons can make a new nest, it gets destroyed–by someone with big footprints. Someone is out to harm the loons. Is it the bully with a chip on his shoulder? The irritable camper with a shady past? Or the publicity-seeking reporter? It’s up to the boys to figure out who, why, and how to stop the culprit– before it’s too late. 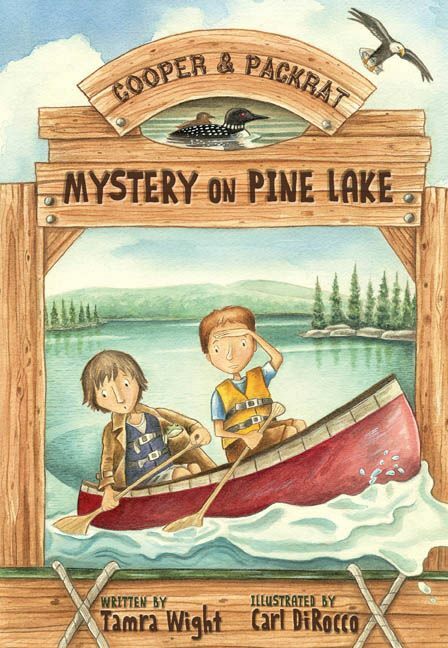 Mystery on Pine Lake named to the 2014-2015 Maine Student Book Award list. Mystery on Pine Lake named to the 2016-2017 Massachusetts Children’s Book Award List! We will get back to you in 48 hours.